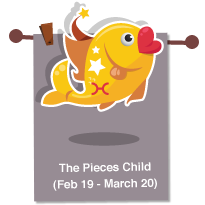 Sensitive and timid by nature, the Pisces child needs extra affection from its parents, so be sure to shower your baby with lots of cuddles, kisses and encouragement, even as teenagers and adults. As children born under this sign are emotionally sensitive, you need to be careful about the influence and exposure that your little one gets and keep them constantly grounded in reality. Your caring, selfless child can be taken advantage by others. So as your little Piscean grows older, teach them to protect themselves against people who would take advantage of them and their trusting nature.